The stoves design and principles are explained with simple sketchs. Many stove designs are existing, but most common designs are presented here. View more presentations from Dr. N. Sai Bhaskar Reddy. See the attachment for full sized pictures. 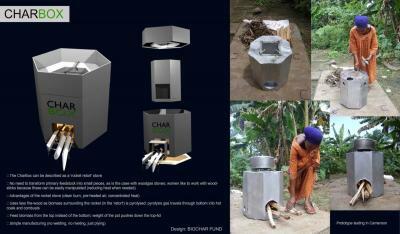 we've designed a new biomass stove that produces char. The stove is a simple hybrid of a rocket stove and a retort. We would be glad if you could upload it to the stoves list, because we want to see what the community thinks of it. It is only a concept, even though we've tested some basic design steps. We will be testing this design at our large biochar site in Congo, where our project soon kicks off. www.rocketstove.org is finally online! And our friend John page from Aprovecho has agreed, at least in the short term, to be the new web administrator. Our goal is to make this a practical site. For example the key content that I have right now is the Institutional Rocket stove design tool that will allow users to generate a custom set of institutional stove plans (brick and metal) just by inputting pot size and a few other key inputs .Ideally this would be the site that users would turn to for specific plans on how to construct rocket stoves , bread ovens, dryers kilns etc. If you have content that features step by step stove plans please register and then post them to the site. (note e: g it might take a day or 2 to approve your registration as I have to manually accept each registration ) . Registered users will eventually be able to produce their own home page if desired , or just add contact info. Foremost I would appreciate it if we could link your webpage to ours and vice versa. The second goal of the site is to link people in the stove community by interest and region . For example someone could turn to the site and be linked to stove producers, purchasers and/or researchers in China, Guatemala, or Uganda. As the site grows into phase two we will add more functionality (ordering stoves online, visitors donating to specific projects, etc) but initially I would love to collect as many links and content as possible in the next few weeks for the launching of the site . At present this is a volunteer effort , and John and I would appreciate any form of support (financial or otherwise) from the stove community to get this web page up and running. The webpage was only made public last week so we are still very much in our infancy so we appreciate your patience as we smooth out the wrinkles. Also, Please feel free to forward this e-mail to anyone you think might be interested. *Presented at the "Developments in Thermochemical Biomass Conversion" Conference, Banff, Canada, 20-24 May, 1996. Since the beginning of civilization wood and biomass have been used for cooking. Over 2 billion people cook badly on inefficient wood stoves that waste wood, cause health problems and destroy the forest. Electricity, gas or liquid fuels are preferred for cooking - when they can be obtained, but they depend on having a suitable infrastructure and are often not available in developing countries. In the last few decades, many improved wood stoves have been developed (the Chula, the Hiko, the Maendeleo, the Kuni Mbili, etc. ), but the new wood stoves are often more difficult to manufacture, often more heat goes to the stove than to the food, and they do not offer good control of cooking rate. They are not always accepted by the cooks for whom they are developed. Because of the problems of wood cooking, people often cook over charcoal. However, charcoal manufacture is very wasteful of energy and very polluting, so the problems of the wood stove are externalized but not solved. Gas is preferred for cooking wherever it is available. Gas can be made from wood and biomass in gasifiers developed in this century, but these gasifiers are generally too big for home use. A downdraft stove for domestic cooking is now being manufactured in China. 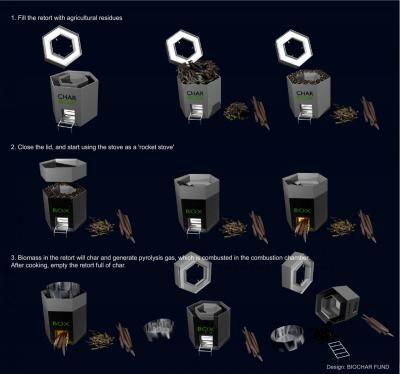 We have developed a new "inverted downdraft gasifier" stove shown in Fig. 1. It operates using only natural convection. 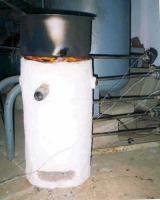 The rate of gas production and heating is controlled by the primary air supply to the gasifier. As an option, the gasifier can make charcoal with a 20-25% yield. 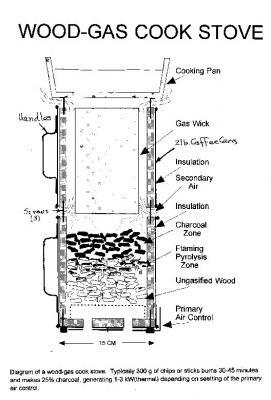 The wood-gas stove consists of an "inverted downdraft gasifier" (shown in Fig. 2) plus a burner to mix air and gas and burn cleanly (Fig. 3). These sections are discussed below. The stove has been started and operated indoors with no exhaust fans and no odor of burning wood. However, we believe that there is still much work to be done in optimizing the stove for various fuels, adapting it to various cooking situations and developing other uses. For that reason we are publishing our preliminary results and hope that others will help adapt these principles to improve world cooking and wood conservation. A drawing for a pressure and flow meter by Frans Peters, an aid in fan design.